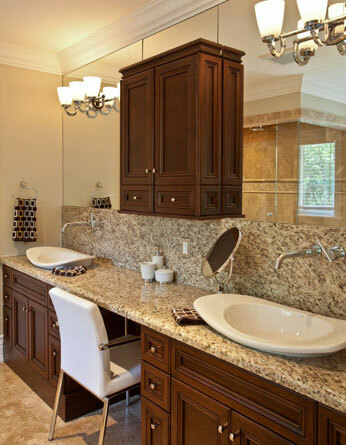 When it comes to designing your kitchen and bathroom one of the most important elements is the countertops. Countertops see a lot of action; in the kitchen they take some abuse from hot pans, chopping knives, and spilled liquid and in the bathroom, they are the resting place for hot curling irons, hair dryers, spilled make-up and more. There are a variety of materials available today for countertops and many times no one material is best for all surfaces. You can see all of your countertop options at Regent Flooring, Kitchen and Bath and discuss the pros and cons of each with a knowledgeable designer. 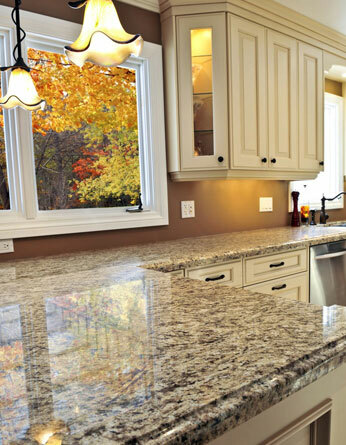 You will find many options for beautiful and distinctive granite countertops. This is a very durable option and each piece is truly unique. It is recommended to occasionally seal a granite countertop. While Marble and Travertine are just as beautiful, they can be more porous and, therefore less stain resistant, which should be considered before making a final decision. Quartz countertops are fast becoming the most popular choice. There are a wide variety of colors and styles to choose from. Quartz is scratch and stain resistant with anti-microbial properties offered from brands such as Cambria, Silestone, Ceasarstone, MSI, Stellar and more. A maintenance free composite material such as Corian and Meganite are also great options. This material has options for integrated sinks and splashes. No matter what countertop you choose, Regent’s skilled installers will make precise templates for a smooth installation and offer you choices to consider in edge treatments and matching backsplashes.